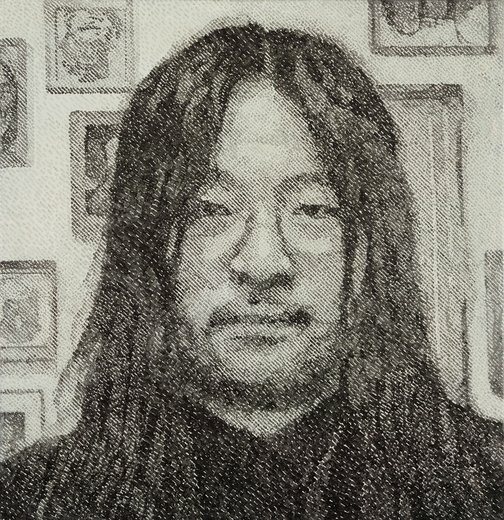 Theodore Wohng is an art collector, a software entrepreneur developing cutting-edge technologies, and a composer of contemporary music. He has also curated numerous shows to support emerging artists in Australia. ‘I first met Theodore in 2011,’ says Pei Pei He. ‘Over the years, I have often visited his home which is completely filled with artworks from around the world. He is a unique character who always wears black, yet he is very warm and personable. Born in Shanghai, China in 1954, Pei Pei He arrived in Australia in 1987. She studied visual arts in China, training in traditional Russian and Chinese academy styles, then continued her studies in Australia, graduating from the Victorian College of the Arts in 2010. She has been a finalist in the Sulman, Dobell and Wynne Prizes. This is her first time in the Archibald Prize.